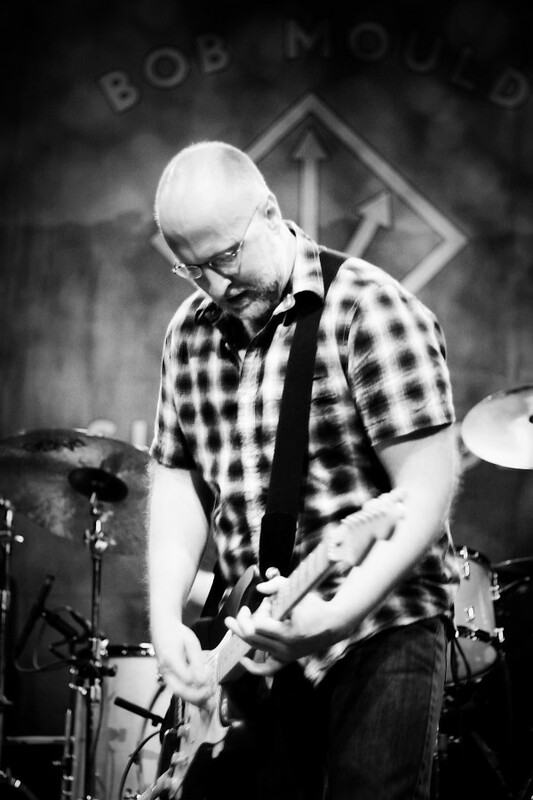 BY PETE TROSHAK Until recently, chances were slim that you would hear much Sugar and Husker Du material if you went to a Bob Mould show. Mould always seemed more comfortable leaving the past, and the old wounds that came with it, alone and being in the moment, which left a generation of fans who loved (or missed out on) Husker Du and Sugar aching to hear those classic songs from alt-rock’s days of yore. The last few years have seen Mould open up more – both in his live song choices and in a fascinating warts-and-all autobiography, See A Little Light. Tuesday night at The Union Transfer, Mould took the stage, bespectacled and flannel clad, looking like a kindly graybeard college professor. The only clue that such appearances were not to be believed was the trusty blue, battle-worn Fender Strat strung low in the classic Bob-Mould-is-ready-for-war position. Mould and his trio – thumping, high-kicking bassist Jason Narducy and hard-hitting, joke-cracking Superchunk drummer Jon Wurster (a native of Harleysville, PA) immediately launched into “The Act We Act” and then proceeded to play Sugar’s Copper Blue album beginning to end. On record, “The Slim” always struck me as the album’s molten, emotional core. During Tuesday night’s slow, dirge-like rendering, Mould wrung out every note like drops of blood from an open vein. It was simultaneously beautiful and excruciating, a live exorcism of old ghosts that raised the bar for the rest of the performance. The band followed the album with a few impressive songs from Mould’s current album, Silver Age, rounded out with four classic Husker tracks – “I Apologize,” “Celebrated Summer,” “Makes No Sense At All.” But the second most mind blowing moment of the night was a raucous, feedback-drenched “Chartered Trips” that left the crowd stunned and their ears ringing until the morning after, confirming what was already a more or less foregone conclusion: Bob Mould isn’t getting older, he’s just getting better. This entry was posted on Wednesday, September 12th, 2012	at 11:05 pm	and is filed under News	. Responses are currently closed, but you can trackback from your own site.